I’ll let that sink in for a few moments. I see a lot of strange things. But I figured out that people can be completely ‘normal’ functioning human beings until they step into airports and onto a plane. Perhaps it’s because I travel more than most people because of my job, that I’ve come to expect everyone to have the same knowledge as me. There is a baggage allowance for ever person and most of us don’t have the luxury of always travelling business or first class so we have the standard 20kgs we’re allowed to take. Some travellers, such as the one I experienced, like to take that on as a challenge. Now, I mean it’s really not my issue and people should do what people are gonna do …… BUT …. It’s pretty darn obvious to me that if your suitcase doesn’t really close, no matter how many of those bag straps you tie around it, it ain’t gonna be within the baggage allowance limit. “Oh dear, are you sure?” They say. “Are you sure your scales are right?” They question. “Can you test my bag on a different scale? I’m sure yours isn’t right.” They try their luck. Traveller pulls said suitcase off scale and, with the help of the extended family who have come to wish her a safe journey, they each take a corner and drag it, huffing and puffing, the clearly 20kgs (!!!) suitcase over to the next counter. All working together, they count the lift in “1…2…3…LIFT” and put the clearly 20kgs onto the scale at the next counter. “I really can’t believe it. Our scale at home said 18kgs. Can we try one more?” They say in disbelief. Traveller realises they aren’t going to get anywhere with this super-savvy check-in assistant. Traveller pulls said suitcase off scale and, with the help of the extended family who have come to wish her a safe journey, they each take a corner and drag it, huffing and puffing, the clearly 20kgs (!!!) suitcase over to the original counter. All working together, they count the lift in “1…2…3…LIFT” and put the clearly 20kgs onto the scale at the original counter. Traveller now has to open the offending suitcase….. first carefully removing the five bag straps they’ve put around it to try to keep it closed,while carefully ensuring none of their “intimates” fly out when the suitcase bursts open with freedom in mind …. And take stuff out. 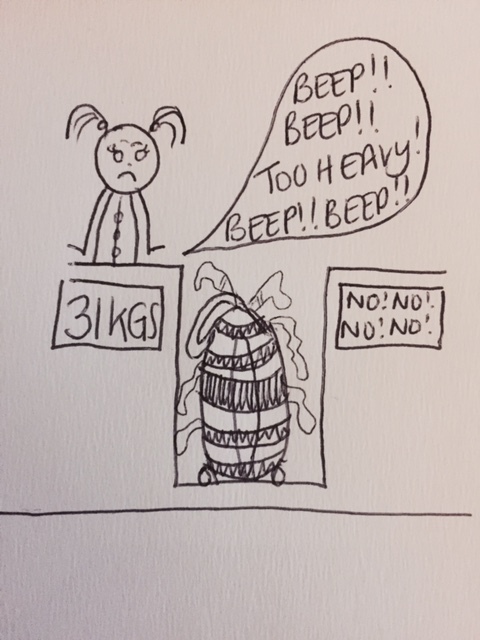 They hand 13kgs of their suitcase content to the extended family, and continue to check-in, still grumbling under their breath that airport baggage scales are shockingly overweight! The check-in person is a saint. As I’m heading through security, I see the extended family helping the traveller put all those 13kgs back into her hand luggage and in her handbag. I’m taking a different queue. Come back for Part 2: The Security Check! This entry was posted in TheFrinkleFiles and tagged airport, comedy, crazy, entertainment, funny, holiday, thefrinklefiles, transport by lmoultrie. Bookmark the permalink.